We timed it, and it took us exactly 15 minutes to crawl along the rough cobblestones up to the highway. Then, it was clear sailing to Chimulco water park. We had been here in March of 2009, and it's along our route so we wanted to stop in for a night. Yesterday's drive, only 39 kms (24 miles) took us exactly one hour! We got to the entrance, and they were only just opening up for the water park and it wasn't yet busy. We stopped at the office and tried to negotiate a deal without electricity, but they have only one price. 260 pesos ($20.28) for full hookups which includes admission to the water park. Definitely more than we usually pay, however when you consider that it costs 100 pesos ($7.80) for one adult to enter the water park for the day, and our admission is included, it's not a bad deal! We took a site close to the office, and our wi-fi booster antenna is able to pick up internet from the office area, so we are happily connected campers, and the wi-fi is lightening fast. Without our antennas, they do have an outdoor covered seating area with electrical outlets for campers to walk over and use the internet. Then we wandered over to the pools. They have three main pools, all with natural hot springs water. It's not hot really, but definitely warm, and it feels nice to jump right in. Then, they also have water slides, and a water play area. ...the bucket tips over and the water comes crashing down on people! We spent the morning at the water, and then went back to Sherman for lunch. There were six other rigs here, in the 45 site RV area. One other from Ontario, and five from Quebec. Another Ontario rig came in later in the afternoon. Sherman, parked up in site number 1. We walked into town in the afternoon. We passed another water park, but they said they do not allow overnight RV parking. Strange, because they have a large parking area. Oh well. So we walked in the central area of Villa Corona. Not much to see here, and we just sat in the central square for a while a watched the world go by. Then we walked over to the church, but it was closed and we couldn't get inside. 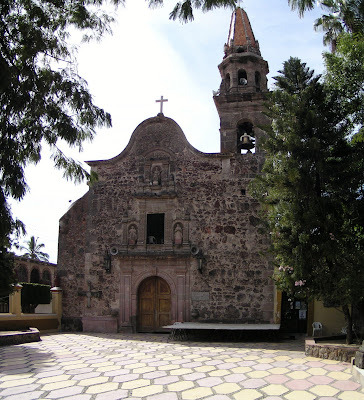 The church in the town of Villa Corona. On the way back, we found a spot by a nearby lake that we could have overnighted at, but it's not ideal. Our thinking is that we will stay at the waterpark for this morning, and then head towards our next destination, an RV park in the country that is apparently only 100 pesos ($7.80) per night. It's only about 80 kms (50 miles) from here, so it shouldn't take more than two hours or so! But we'll be taking some backroads and we don't know what condition they will be in so it could be interesting. Always up for an adventure! good luck with the travel adventure today! !..love the new header shot! !..the pool looks very inviting!! The view over your tooties to the pool looks nice. Nice looking water park and not too bad a price considering admission is included too. Sounds like you had a fun relaxing day. No need to rush anywhere just enjoy the journey. That looks like a very nice place to stay. Nice header picture too! We sure are having a good time at the water park. And what a gorgeous church. Enjoy the drive today. Love that header picture. I am certainly enjoying following your travels. I am one of those people who are intimidated by the thought of traveling in Mexico and your blog has challenged me to rethink my opinion. That water park looks delightful and the fee sounds very reasonable. We really enjoy visiting different churches no matter where we are. That one is beautiful. Enjoy your relaxing morning and safe travels in the afternoon. You are certainly whetting our appetites for Mexico. Right now we're in Ozona, Texas, on our way to meet up with some people in Nogales. It make me feel good that even though I'm not down there yet, YOU are having enough fun for both of us. The water park looks fun and refreshing I'm sure. Oh that looks lovely! Wish I was there! Sue and Doug...Thanks Sue, the pool was lovely! Bob...You don't go anywhere fast in Mexico! George and Suzie...Compared to Roca Azul we thought that you got more for your money and it was cheaper. If we had to stay for the whole winter and our choice was between here and Roca Azul our choice would be here. Much nicer in our opinion. Karen and Al...It is a nice place to stay. The pools are great. Jim and Sandie...We love to look at the churches in Mexico, they are always interesting and very often old. Donna K...We are glad you are enjoying our travels. We feel we are doing our job when we can show people the nice side of Mexico and make people think twice about it. Elaine...When you take the admission price into account our full hookup is only 60pesos (about $4) for one night. Not too bad! FULL-TIMERS...We love the architecture of churches. They are almost always interesting. Paul and Helen...Glad you are enjoying our travels. Won't be long now and you will be enjoying them too! Look forward to reading about your tales of Mexico. Paul...The water park was lots of fun and so relaxing. Lea...It was lovely. You will have to try and make a visit here one day. That church is just fascinating! And the water park/campground price is not too bad. I would like to play for a day in the water too--- but thinking kids screaming and running all over the place would drive me nuts at most of the water parks we see here in the states. Sure looks like a good campsite and free wifi is a very good thing! Karen and Steve...We love the many churches here in Mexico. Many are very old and very interesting inside and out. We had fun watching the kids and the families, they were all well behaved and having a great time at the water park.